Wednesday 2/22 I guided two new clients Billie & Karen Diggs, Durham, NC, and I met up with in Ashe County and we fished two waters, had cloudy skies then rain that set in….or in other words, ideal conditions, it was on from the start. We did very well, and did well nymphing some deep holes and runs. The rain set in and was pretty steady, not to mention about 20 degrees cooler than past several days with temps in the 40s. The kind of day we need right now, not the nice, warm 70 degree weather we’ve been having. We did well on attractors (mop fly did well), zebras, small black stones, and my cadillac caddis. The first spot was pretty awesome we must have caught 20 or so from it it was great, and missed several others. We fished our way up and had similar results, I guess netting between 30 and 40 or so. We fished two waters, caught a couple on the second stream we fished. It rained on us all day long, meaning a truck bed load of wet gear…but I’ll take it. Fishing was great, and will only get better. On Thursday 2/23 I guided Curtis Reeves Group, Archdale, NC, NC Mtns, and did a 3 person trip with Curtis, who is a regular client of mine , and two of his co workers Drs Dipendra Chaudhary and Shanker Polsani, we met early and hit the water by 8am, great day, cool and foggy gave way to beautiful sunny skies and warm temps, about as ideal a day as far as temps you could get. The water was up but clear which made for good nymphing. Curtis is a great angler, one of the several I have the privilege of spending a day with. He did pretty well fishing the long rod, a 10 foot euro/french nymphing rig and caught a lot of fish with that. Dipendra and Shanker were getting started fly fishing. After explaining rigging, casting, line management we hit the water. It only took a few minutes to get a score, we were into fish pretty quickly and both of the guys landed their first trout ever. It was one of what would be many on the day, the guys did great. We caught a lot of fish on Y2Ks and small caddis nymphs, rockrollers and netbuilders, small dark caddis which are hatching where we fished. We landed about 30 t0 35 fish or so, took a lunch break early afternoon, and Dipendra and Shanker left about 2:30pm. I then took Curtis to another water, where we caught one small rainbow, so we returned to where we had been earlier and caught a few more and called it a day around 530pm. Great day….weather is unbelievable. Don’t recall ever seeing stuff blooming this early, even around here. With the warmer weather a lot of bugs have been coming off, will continue to do so, and the only setbacks are going to be when a cold front or blustery weather comes along. That will happen, but as I see it, spring is here. 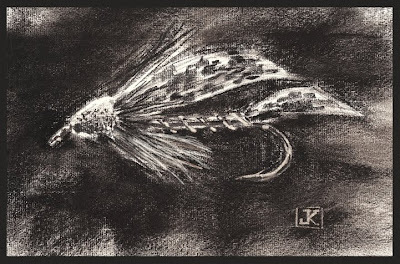 No doubt with this weather some serious dry fly fishing lies ahead. And if not, nymphing will be great. Spring time is when there’s more food in the river and drifting, as all of the bugs that will eventually be hatching are still there or mostly there. All in all….great fishing lies ahead. And we’ll be right in it. Posted from the heart of Appalachia…..
Tues. Feb. 21,2017 …The season of back to back to back to back 15 to 18hr days is upon me……Looks like spring has sprung early. Had another great day today guiding Ron and Shapley Davis from Winston-Salem, NC. We met up early and headed to the Catawba R. We were expecting cloudy weather and that is exactly what we got. And great fishing too. A good many bugs ….caddis, black stones, and bwos all coming off but we did best nymphing. Ron and Shap put between 40 and 45 fish in the net, many of which were quality rainbows. Did really well on mop patterns also, along with my Cadillac caddis, and purple back baetis. 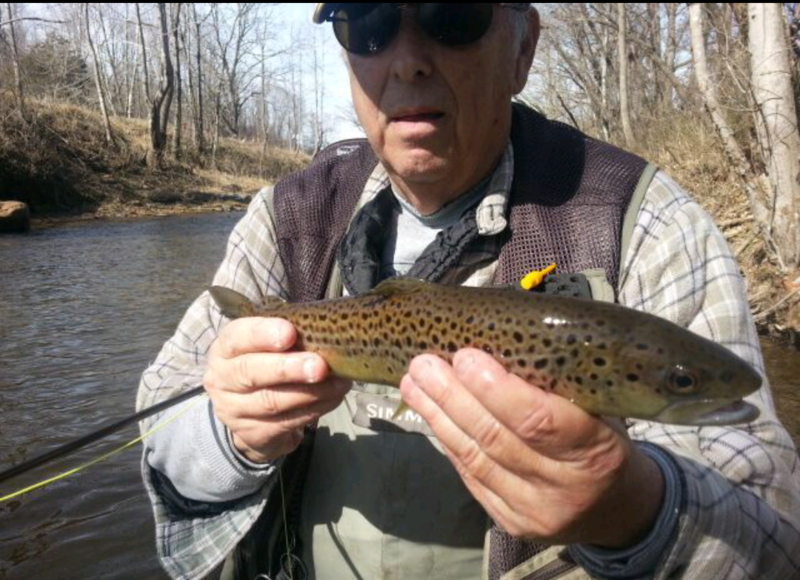 We landed several really nice near citation sized rainbows. No other anglers. Great weather and no anglers….hard to believe. But that is what we got. We fished til late afternoon and called it a day. Looks like rain tomorrow, and we need it. Things have gotten dry in a hurry with the warm weather. We are about 20 days ahead of schedule as far as weather and fishing with mid to late March conditions. Guiding another trip tomorrow, Kathy and Billie Diggs, Durham, NC. Should be another good day under showers and cloudy skies…..fingers crossed! Headed out today to guide Ron Davis and his son Shapley and we are looking forward to amother good day. Mon. 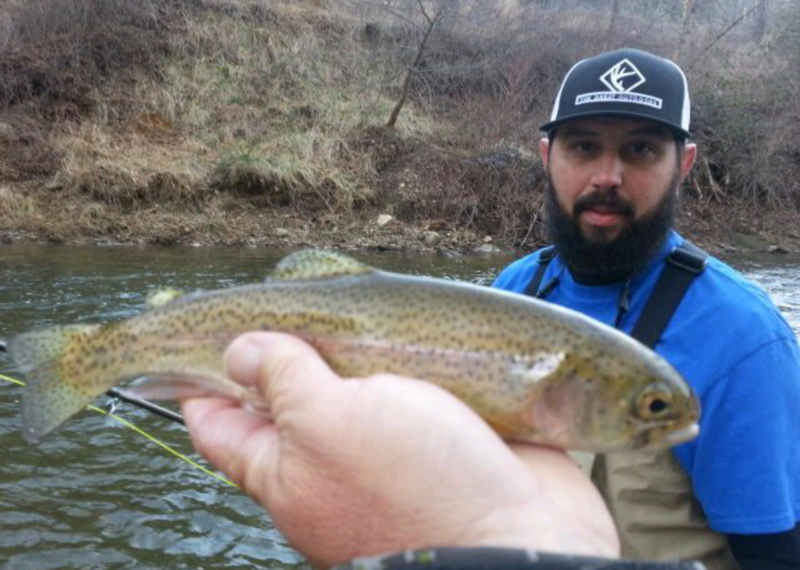 Feb 20, 2017….Trip, Travis Leatherman, Statesville, NC, NC Mtns, it was Travis and a co-worker Garrett, and we got an early start and were in the water at sunup, which would prove to be a good move on the water we fished in Mitchell and McDowell counties, as on the first few nice Saturdays in late winter and spring you can expect other folks on the water. Would prove to be a good move, we nymphed most of the day sans a few dry fly moments here and there, and caught most of our fish on one of our mop patterns , a version I call a BRB , short for “Blue Ridge Banana” , it was killer, and the usual assortment of midge droppers, both brown and black, zebras, and usually this time of year you can hardly go wrong with either. Water is low and clear, even with all the rain and snow, and we need some rain soon. LOTS! Doesn’t take too many warm, dry , unseasonable days to get into this situation, where we are now in. Part of it is without leaves on the trees yet any warm, dry weather dries things out quickly. We fished through several stretches and caught all rainbows, 40 or so of them. We didn’t get into a lot of fish at any particular place but would pick up one here , two there, maybe 5 or 6 at better spots. All in all a pretty good day on any water, a 40 fish day anywhere in February is a good day. A 40 fish day anywhere anytime is a good day regardless. We got some light rain at the end of the day and ended the day on one last stretch that produced 8 fish, and again, all rainbows. Headed out to do it again today guiding Larry Tomar and Ben Keller. Shouldbe a good day. 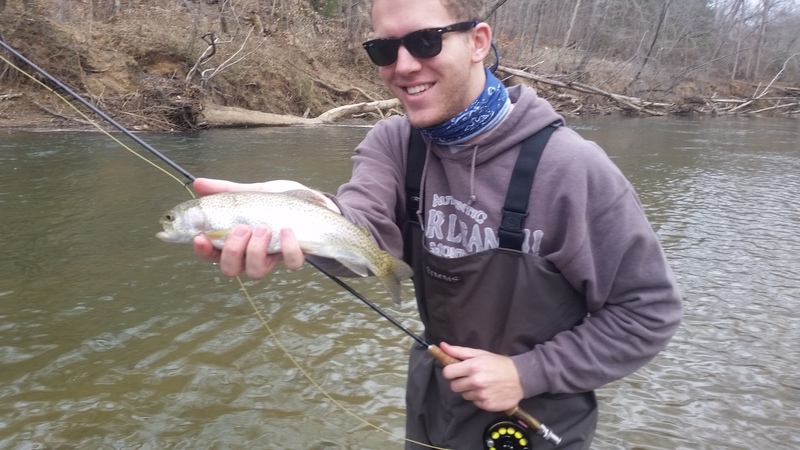 …..
Good Day on The Tailwaters. ..
Fri. Feb 17, 2017 …Spring like weather has returned as temps have climbed up to the 50s/60sF. 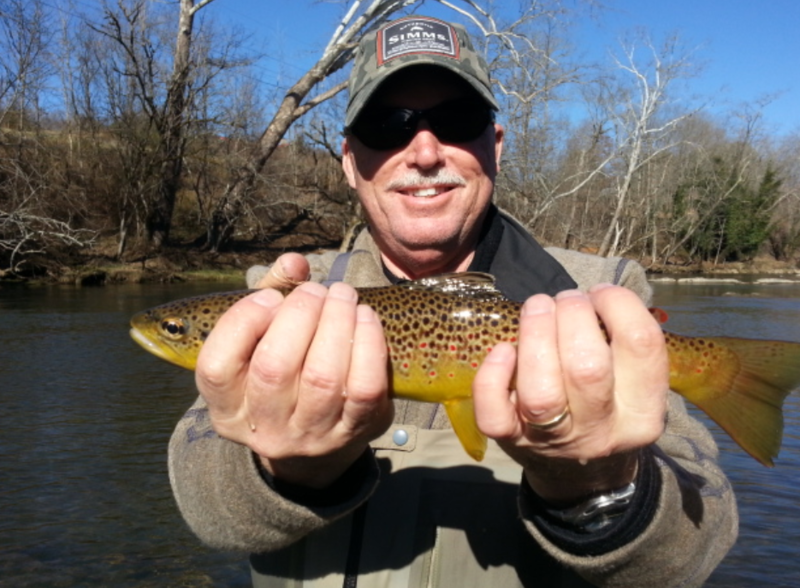 I did a Friday lesson /trip with client Rick Allen, Archdale, NC, and we spent the first half day on the Watauga (TN) sound a reading water lesson and nymphing up several nice browns on caddis and midge patterns. We also got some olives and caught some on dries also. Just after midday we headed over to the Soho and got some browns on nymphs, including one really nice fish, and then ended the day with a great bwo hatch and rising fish on dries. Great day and one that started out chilly and very breezy but that improved as the day progressed. By afternoon it was warm and quite nice. Guiding a Saturday trip in Western NC , client Travis Leatherman and we should have a mild weather day. More New Items on Our Used Equipment Page…. Items on our Equipment Page must be purchased through that page. You do not have to have PayPal or a PayPal account to purchase anything. Have had several folks inquire as to posted signs on the gate at the end of the road or the property where you always were or have been able to fish just fine. I know the folks who own this property and the Mitchell River House, Laina and Sheff Olinger. I know them well. IT IS NOT ILLEGAL AND YES YOU CAN FISH ANYWHERE IN THAT IMMEDIATE AREA EVEN WITH POSTED SIGNS BEING THERE. Here is Laina Olinger’s (the owner) reason on why the signs are there…. You are welcome to fish!!!!! Everywhere you have in the past! In fact, we are up visiting for the week so the gate will be open and you are welcome to fish from the bridge. We are having a problem with illegal hunting/poaching going on and the Sheriff and the game Warden told my husband he had to post NO Trespassing signs as an “official warning” so they could arrest and fine anyone caught on our property without permission. Please pass that along to fellow fisherman, they are always welcome, we love the presence of the fisherman in the river! I know it is confusing but necessary. For the time being. We have also had two break ins in last week so you might see more of the Sheriff around. If you see anything suspicious please let us know. On a different note, I am still booking space for our August Wyoming Trip, and there’s time to jump on board if you so desire. Would be glad to have you ! 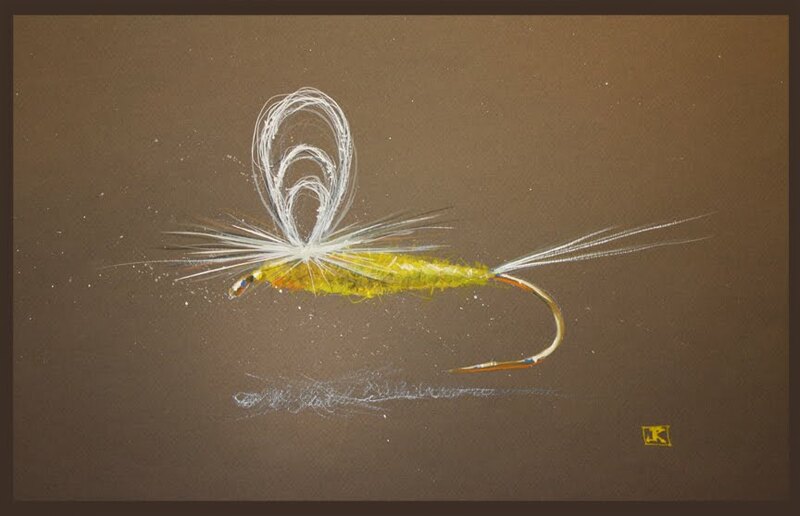 Text or call at 336-944-3628, or email jwflyfishing@gmail.com. New Items on our Used Equipment Page…..
It’s items I’m selling for a client so it’s first come/first served with no holds. One South Holston Access Point in Jeopardy…..
Mon. Feb. 13, 2017 …. The issue is that a longtime river access (camping, parking, wade fishing spot, private boat ramp) that has always been available to the public and operated by Victoria Mottern is being threatened. There’s never been a problem with this but it threatens one of our most valuable river accesses, and also eliminates Victoria’s ability to earn income. Her dad in his passing left her this property, and the property and its income earning potential is all she has, and being a father myself, I’d get pretty ripped over anyone threatening to do any harm to her in anyway, let alone this. It grates me in the worst kind of way. Let me state, I usually never involve myself in a dispute like this or of any kind but this I cannot sit idly by and say or do nothing. What is happening here is WRONG. Customers and I use this resource a lot, and I will fight for it and I am obligated to my customers to do so. I knew Victoria’s dad, Jud, for years parked there, decades before any parties causing a current problem were even in the area. So in other words, if anyone has a right to do what they do on the said property its Victoria. You and I both stand to lose an access point if we do nothing. I will continue to fish the area regardless, and we float it all the time, so I will always use that part of the river but it would no longer be a park and wade access point. So if you feel so inclined to join in standing against this, read on. “I have been informed that Pursuit Farms is in a A-1 zone and needs to be changed to a AR zone. I am no longer allowed to let anyone camp or park at Pursuit Farms until the zoning is approved by the Sullivan County Board. I need your support to encourage their decision to approve my request! As you all know my father, Judson (Juddy) Mottern, started this business within the heart of friendships he grew with so many individuals. He started allowing campers and fishermen to come on the property 10+ years ago. My father passed away December 22nd 2011 leaving me with the property and growing business. His dreams, prayers, and many conversations were for me (Victoria) to have a future and career within this farm. He wanted nothing more than me to be successful. We have never had any problems or “neighborly complaints” from anyone so this is a first for me. If this request is denied than Pursuit Farms will be closed and will no longer be allowed camping or parking. My future with Pursuit Farms will be demolished and my dreams will be crushed. I ask you as Judson Mottern’s friend, my friend, my family, my neighbor, loyal customers, fly fishermen, family campers, guide services, fly shops, and all others, please sign this petition to keep Pursuit Farms open! Thank you for taking time to read this, and thank you so much for the support! CLICK HERE TO FOLLOW THE SITUATION AND PURSUIT FARMS on the Pursuit Farms webpage/facebook page. Thanks for taking time to read this and please join me in the fight by signing the petition. Its the first step in insuring this access point is available for years to come and that Victoria can continue to have a job. Sat. Feb. 11, 2017 ….I have taken a few days and the weekend off as we received some tragic news from Wyoming, my long time friend and fellow guide Josh Roth, who owns and runs Hoback Peak Outfitters, Alpine, WY, and with whom I have guided almost two decades of pack trips in the Wyoming backcountry died tragically in an avalanche in the McCoy Creek area on the Wyoming /Idaho border. Its an extremely rugged area, one I have fished near, hiked in, so I can attest to the rugged nature of the entire area. Aside from being a backcountry guide, hunting and fly fishing guide/outfitter, Josh was also a pro snowmobiler and was well known in those circles. Weather of late has been all over the place in his area, epic snows followed by warm and rainy, destabilized the immense snowpack causing flooding in lower elevations now but was causing avalanches as well in the high country. I can scarcely believe this has happened, things out there will never be the same without him. This sort of thing is more common in spring, usually not in February. Our prayers to his family, notably his mom Cherie and sister Brittany. I hesitated to post this but decided to to honor him and also to let so many of my clients who have spent weeks out in the Wyoming backcountry with Josh and I chasing the wilds of Wyoming, wild , free rising cutthroats, and brookies, and enjoying the stars, mountain air, campfire times that are truly unique to Teton Country. We had been discussing this year’s Wyoming trips and little did I know that last week when we last talked it would be the last time I’d ever have that opportunity to talk with him. Will miss my brother more than words can say. Wyoming K2 Radio Station report click here . NBC Channel 6 KPVI News click here . Please pray for his family as they are going through a really tough time…. Fri. Feb 3, 2017…. Videos are great for that quick visit to the outdoors after a rough morning meeting, a hectic workday, you name it. Its great to be able to keep the passion and fire burning til the next fishing trip. Videos are great for that, whether its seeing a large fish landed, seeing runs and riffles that remind us of that favorite spot, whatever it is it’s a great way to escape to the water…if only for a little while. Here are a few of our favorites from our fly fishing video YouTube channel here . We currently have well over 500 videos there and add new ones on a regular basis. The last two have some footage with my two sons, Josh and Ben, and its great to have two that love to hunt and fly fish and who are good at it….makes me proud! Great time to get out fishing if you can, I’m taking today to do plenty of stuff here with the boat and gear, flies, maintenance to our several websites, plus a family get together and weekend on Saturday. Guides Capt. Ben (my son , on left) and Capt. Jud (right) with a Louisiana double. Living the dream…..Ben and Jud share a house in Wrightsville Beach/Wilmington, NC area and this photo is one from Capt Jud’s place in Louisiana where they do fall Redfish trips.